It was in 1992 that Longbrook House was constructed for the Inland Revenue in New North Road. The new building replaced two 19th century buildings on the site which, in their own way, where important industrial and commercial centres in Exeter's growth. The four fields that made up Rockfield, in St Davids stretched from the lodge at the entrance of Northernhay Park, across the railway to the top of Prison Lane, right along Howell Road almost to Longbrook Street and lastly along Longbrook Terrace. In 1834, New North Road was driven through the south western corner of this block of land to create a new road around the north of the city. It was next to the New North Road that an industrial building, numbered 35 New North Road was built on the corner of Longbrook Terrace. Built as an iron foundry and showroom, the new building had a magnificent, classical style frontage, which many will remember. Square, corner pillars were topped with a 'Greek temple' style roof and steps that led into the showroom. There were a variety of other 'working' buildings behind. It is not known for sure, but its similarity in style to the Higher Market indicates that it could have been built by William Hooper, who completed the market building in 1838. "Comprising a spacious Showroom, 53ft long and 27ft wide, communicating with a storeroom below of like dimensions, and an extensive Smithery, including a blowing-engine and a hydrostatic engine for proving pipes, Machine and Model Rooms, with Stabling, Cellars and Yard behind the same, having access from an entrance in Longbrook Terrace." The furnace could produce 2 tons of metal per hour. And what did 2 tons of metal produce - everything from agricultural implements, patent kitchens and stoves, bedroom and drawing room grates, water closets and wheel and gear work. A patent kitchen cost from £8 10s to £13 while a bronzed fender was 14 shillings (20 shillings to the £). Upon the death of Charles Coldridge in 1845, the business was put up for sale in the 5 June 1845 issue of Trewman's Exeter Flying Post. The next business to occupy the premises was the Northernhay Brewery run by John Hyett, who traded through to the late 1850's. When the brewery closed the building housed a music-hall, from which the building may have derived the name Rockfield House, and later, a cornstore. In 1869, the Bristol brewery of Charles Garton Russell and Co. used the building as a brewery store - the coming of the railway to Queen Street gave them the use of sidings for transporting their products. The store supplied locally via horse and cart or further afield to Okehampton, Barnstaple, Ottery St Mary, Seaton and Torbay by rail. It is probable that Garton Russell were responsible for placing the 3ft long cast-iron sphinx statue on the pediment of the building with the trademark 'Puritas Viresque' (pure and strong) cast along its base. In 1900, the Anglo Bavarian Brewery took over the premises. A former manager of the brewery, Robert Mercer Flint established a business manufacturing tents, marquees and tarpaulins in the same building; it is very likely that the foundry was on the floor beneath the main building, and Robert Flint was in the upper section, adjacent to New North Road. He also installed a sail loft in the premises and advertised a sail repair service for boat owners down on the quay and canal basin. This business occupied the building until 1928 when it moved to Fore Street. The adjacent building, Rockfield Works, of which more later, was occupied by Reid and Lee in 1907. In 1928, they expanded into Rockfield Hall, now known as 35 New North Road and opened a showroom and motor accessories department. Many will remember them, as they only vacated the premises in the 1980's when they moved to Marsh Barton. The last tenant of Rockfield Hall was a second-hand furniture company called Dickens - they were ideally placed to take advantage of the many student houses in the area. It was in 1991 that the site became vacant, ready for demolition and redevelopment. A two storey brick and stone building, with a rear workshop, Rockfield Works was built from 1872 to 1874 on the land between Rockfield House and the railway. The frontage had central sliding doors with four stone-arched windows on each side. The upper floor had nine similar windows facing the street. The already established Exeter hat manufacturers of Messrs. Edwards and Sons had commissioned the building. The business briefly flourished, then in 1881 a liquidation notice appeared in the Exeter Flying Post - the partnership was dissolved, leaving one partner, William Edwards, to continue in business from the Rockfield Works until 1887. They were declared to be 'The only Felt Hat manufacturer in the County' in an 1885 edition of the Exeter Flying Post. In 1887, Edwards moved his business to Northernhay Place and Henry Massingham, who first visited Exeter in the same year had canvassed local businesses on the setting up of an electricity generating company for Exeter. It was in 1879, that Thomas Edison developed his first practical electric generator and who, over the next few years developed methods of switching and distribution that would lead to the practical use of electricity. Massingham, a shoemaker, was farsighted enough to see the potential of the new invention. He set up a demonstration with overhead wires on high poles in the High Street, Queen Street and St Sidwells - the result was the formation of the Exeter Electric Light Company. Rockfield Works was the ideal building to set up the generating equipment and at a cost of £21,000, two AC and two DC generators installed along with a distribution system of 99 iron posts. The first customers were the new Theatre Royal which opened on 7 October 1889 as one of the first electrically lit theatres in the country. In 1896, the City Council purchased the electricity station for £7,500 and operated under the name of the City of Exeter Electric Company. It was the introduction of the electric tram system that spelt the end for the Rockfield Works generating station, as the extra capacity needed for the trams were to be supplied by a new, larger generating station in Haven Road. The New North Road building again became vacant in 1906. It was in 1907 that Reid and Evans, a specialist taxicab company opened in the Rockfield Works as the Blue Taxi Co. By 1927, they were known as Reid and Lee and they had become automobile engineers of 'Rockfield Automobile Works'. As already noted, they expanded into the adjacent 35, New North Road, or Rockfield House in 1928. 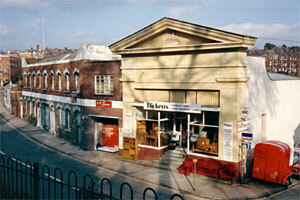 They also acquired the use of the old horse drawn tram depot at 41a New North Road, the present Freefit Services. Reid and Lee moved the whole business to Marsh Barton in the early 1980's and ceased to trade in 1990. After Reid and Lee, the buildings had a succession of tenants including Eveleigh's Accessories, Maxi Car Hire, Exeter Vehicle Services and the Exeter Natural Health Centre. It was in November 1991 that the demolition of Rockfield Works and Rockfield House commenced. The new office building by the EBC group has four floors, for 300 workers. 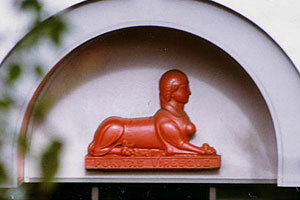 After pressure from the Exeter Civic Society, the Sphinx that had been a prominent feature of Rockfield House, was refurbished and placed above the corner, main entrance of the new building. Source - heavily based on original research made available to me by Steve Coombes plus a biography of Thomas Edison. Also the Edward VII Coronation Programme, and the Exeter Collection by Ian Jubb. © 2005 David Cornforth - not to be used without permission. The buildings prior to Longbrook House. The Sphinx was over the original building. 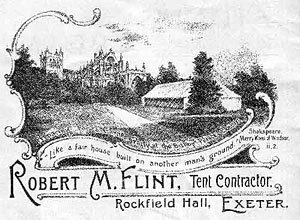 Robert Flint advert from circa 1902. 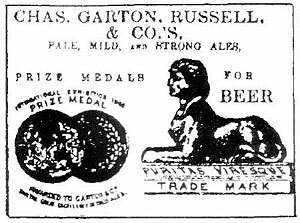 Garton and Russell advert. If you have any photos relating to Longbrook House or the buildings previously on the site, and would like to share them, please contact me on the email address at the foot of the page.